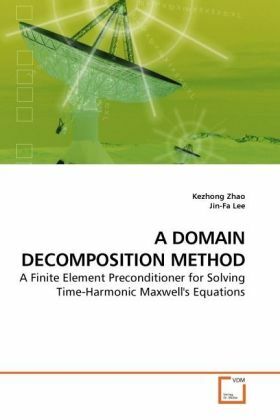 This monograph presents a domain decomposition method as an effective and efficient preconditioner for frequency domain FEM solution of geometrically complex and electrically large electromagnetic problems. The method reduces memory requirements by decomposing the original problem domain into several non-overlapping and possibly repeatable sub-domains. At the heart of this research are the Robin-to-Robin map, the cement finite element coupling of non-conforming grids and the concept of duality paring. In order to account the radiation condition exactly, a boundary element formulation is hybridized with the present DD method, also through the aforementioned novel concepts. It will be shown that the proposed hybrid offers simultaneously: (1) symmetry, (2) modularity, (3) non-conformity between FEM and BEM domains, (4) free of internal resonance, and (5) natural and effective preconditioning scheme. Lastly this monograph presents a DDM solution scheme for analyzing electromagnetic problems involving multiple separable scatterers. This book is ideal for all those interested in parallel computing and computational electromagnetics.